Four neighborhoods make up Atlanta’s historic Westside – Vine City, English Avenue, Ashview Heights and Atlanta University Center. They also define the Westside Future Fund’s boundaries and are the focus of its mission: to organize and fuel Westside revitalization efforts so the area may grow, and its residents succeed. The Westside Future Fund advances its mission by connecting resources with needs; convening the right people around the table; collaborating on strategies; and coordinating all these efforts, which are vital to the Westside's long‐term success. The Westside is comprised of some of Atlanta’s most challenged neighborhoods. It is also the birthplace of the American Civil Rights movement. Iconic civil rights leaders like Ambassador Andrew Young grew up in this area and Dr. Martin Luther King Jr. himself chose to raise his family here. Today, 52% of Westside residents live below the poverty line, only 79% read above the third-grade level, and 40% of all housing is vacant. What does the Westside Future Fund focus on? 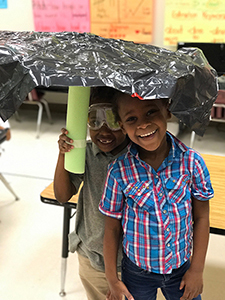 Cradle-to-Career Education: Which includes a focus on early childhood education and a unique partnership with Atlanta Public Schools’ Hollis Innovation Academy. There, WFF’s support ensures a very low teacher-to-student ratio and wrap-around family support services. WFF also provides training for adults to access living wage jobs. By working together we all gain a louder voice, clearer path, and a more successful future. But most of all, the Westside Future Fund is helping figure out ways to change what sometimes feels like a pre-determined future. Without coordination, capital, and a concerted effort to address serious community needs like education, public services and affordable housing, the Westside will go the way of other historic Atlanta neighborhoods – toward unchecked gentrification, top-dollar development, and dramatic socioeconomic shift. The Westside’s residents, especially those who rent at low cost, will lose their homes. History will lose its grip on a pivotal landmark in the story of American civil rights. And Atlanta will lose its last, best opportunity to show everyone how a world-class city embraces growth, prosperity and population boom.